A personalised vintage shabby chic metal dancing feet sign. A personalised vintage shabby chic metal "Grab A Brolly" sign. A personalised vintage shabby chic metal flip flop sign. A personalised Mehndi design metal sign. A personalised swirly style metal dancing feet sign. A personalised swirly style shabby chic metal wedding post box sign. A personalised vintage shabby chic metal wedding post box sign. 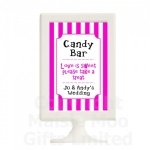 A personalised metal candy cart sign.